Pamela: Your background in historic preservation and curatorial work certainly lends itself to writing historical fiction, and I’m wondering how you made the decision to write books that, for argument’s sake, I’ll call romances. With THE TURNCOAT, the love story was absolutely central, and you gave Kate and Peter a Happy Ending – I suppose it could have been HEA or HFN – did you leave that open for a possible sequel with their further adventures? Donna Thorland: I fell hard for historical romance when I read Dorothy Dunnett’s Lymond Chronicles. I loved all of the swashbuckling adventure, the quotations in Latin, French, and Spanish, the tangled familial relationships and the desperately fought duels, but it was the romance threaded through the series that made my heart beat faster, the palpable longing between Lymond and the heroine, whose name is a spoiler for anyone who hasn’t read the books. Dunnett’s work wouldn’t fit the current RWA definition. It takes six long volumes full of poisonings, politics, and fiendish plotting to get to Lymond’s happily ever after, but when it comes, it’s a profound union of equals, of two people who challenge each other to become their best selves. That’s the kind of book I wanted to write. Pamela: Glad to hear it! I really do like the trend towards following a married couple past the HEA into another book. But for their wartime courtship which was the focus of THE TURNCOAT, I loved the way you deconstructed some traditional romance tropes, like the charming and dangerous hero (I read Peter as more of a survivor than an alpha badass) and the sheltered and inexperienced heroine discovering her sexuality (Kate’s complicated sexual awakening that includes a man other than the hero was such a bold and risky plot move!). What led you to engage with traditional romance tropes so directly and centrally, rather than write the kind of historical fiction where the romance is merely an element among other central themes? Donna Thorland: After Dunnett I had a hard time finding the kind of adventure driven romance I was looking for—books that had the capacity to thrill and at the same move me. I found books in other genres that came close to striking the right balance—I love Terry Pratchett’s Night Watch books, George MacDonald’s Fraser’s Flashman, Elizabeth Peters’ Amelia Peabody series—but it was in romance that I most often discovered satisfyingly emotional storytelling. Pamela: I think I know what you mean – it’s why I really loved Bernard Cornwell’s Sharpe series, yet I always wanted the romance to be more central. On the other hand, we both followed the rich discussion around Sunita’s “romantic vs. romance” post, so I know you define your genre somewhere at the edge of romance — as the “swashbuckler.” Very apropos! And especially perfect for your new pirate-themed book. How does the swashbuckler relate and/or overlap with the traditionally defined romance genre? 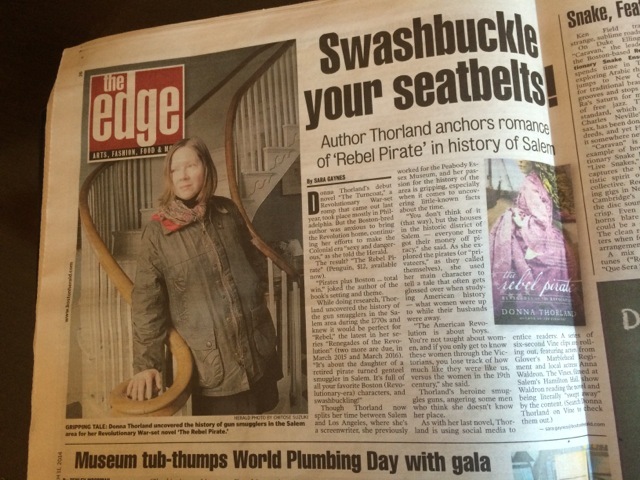 Donna Thorland: I define the swashbuckler as a blend of action, adventure, and romance in which single combat between a protagonist and an antagonist plays a crucial role. The Three Musketeers is a swashbuckler, and so is Steven Sommer’s excellent The Mummy. Not all swashbucklers end happily, but my books fall into the camp of those that do, like The Scarlet Pimpernell. You will not be surprised to learn that I am a huge Lauren Willig fan. Pamela: OK, let me follow up about this notion that this genre — the swashbuckler — relies on single combat. Do you mean this literally as well as narratively? That is, must there be physical combat between hero (or heroine) and villain? Does it work if the combat is a battle of wits or strategies, or must there be swords involved? This is interesting to me because it was reading THE TURNCOAT, which involves mortal danger and physical combat (in addition to torture) that made me want to explore the ways violence functions in the romance genre. And I’ve been thinking and writing about that theme in the months since then. Kate and Peter’s story was just that much more dangerously and graphically intense than typical historical romance novels. I guess that’s partly the wartime setting under an army of occupation, and partly the swash of the buckle! Donna Thorland: Terrific question! Some day I really want to write an essay that surveys and defines the swashbuckler as I see it. The short answer, though, is that the combat can be a battle of wits. Dunnett uses it to devastating effect in Pawn in Frankincense. I don’t want to spoil those books for anyone but she builds up a ruthless villain who may in fact be cleverer than the hero and their climactic battle is one of wits, although the stakes are life and death not just for Lymond and his antagonist but for a whole cast of characters we have come to care about. Pamela: What about American historical romance – I am always on the lookout for colonial and Revolutionary settings in romance, but I can’t tell if we are actually seeing a trend towards more books like this. Do you think it is more or less popular as a setting for HistRom these days? 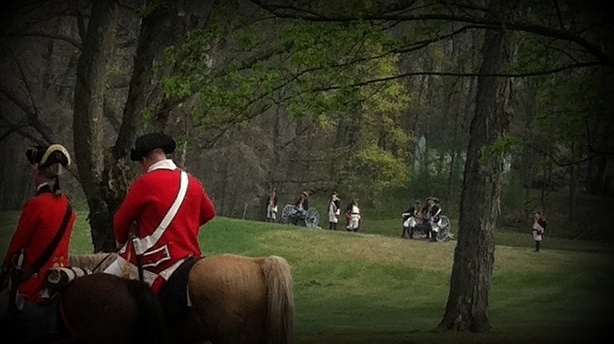 American romance readers seem to have an endless appetite for English and European settings, but are there audiences for RevWar books anywhere outside the US? Donna Thorland: I hear from readers in the UK and Australia who really enjoy this setting, so I think there is an audience. It’s a revolution after all—and why should the French have all the fun? I’m hoping that the enthusiasm for AMC’s TURN and Fox’s SLEEPY HOLLOW will bring more readers into the fold. Pamela: Both books involve heroines who undergo dramatic changes in circumstance that require them to transform their outward appearances. Are the elements of disguise, assumed identities, deception, honor, and betrayal, among the hallmarks of your “Renegades of the Revolution”? 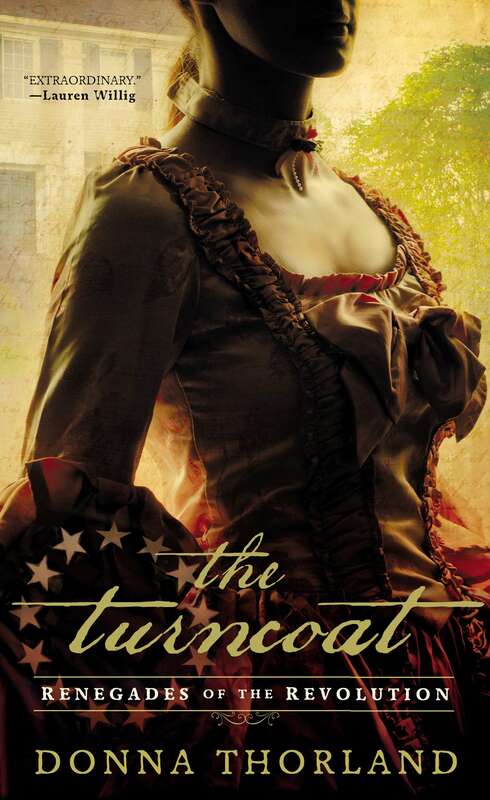 Pamela: In THE TURNCOAT, although British officer Peter becomes the literal turncoat, it is patriot Kate who most radically “turns” her coat — or her dress — to become a completely different person on the outside. And it’s more than just taking on the persona of a wealthy Loyalist: I really felt as if your careful descriptions of her lavish clothing, powdered hair, and domestic accoutrements conveyed the sense that she was constructing an artificial gender identity. Not exactly a Deborah Sampson, but certainly perilously hiding in plain sight, and as a spy, in greater danger should the artifice be exposed? And it’s interesting to think about Kate as a “soldier” for the Revolution in disguise as the brittle Lydia, in contrast to Deborah’s literal enlistment as a man…? I just loved how you played around with themes of loyalty, identity, honor, and deception. Donna Thorland: One of the things that I really like about that title is that almost everyone in the book, at one time or another, could be considered a turncoat. Not just Kate and Peter, but Peggy Shippen and Benedict Arnold, Andre when he trades Kate’s whereabouts for the letters, and even Arthur Grey when he lets Peter go after the skirmish in the woods. There’s a quick description of Kate’s preparations to meet Peter at the house in the Neck, and though it isn’t a full scene, in my mind, the clothing, the hair, the makeup, the jewelry, is how Kate arms herself to do battle. If I had the opportunity to shoot it for a film, I’d cover it the way Peter Jackson covered the arming of Theoden in The Two Towers. If there is a geek meter on your blog, I have just broken it. Pamela: Oh, I just re-watched that, this time with my daughters! It’s a great parallel. We join you in geekery. Though I know nothing about filmmaking, I’m very much a history geek, and they are digging into local colonial history right now in their 5th grade social studies unit. I hope they are getting a more balanced view of historical women than the one presented when I was their age. Do you aim to educate as well as to entertain, by weaving your stories through and around the real history of women in the Revolution – ordinary women as well as women who took grave risks for love or patriotism, such as Kate? 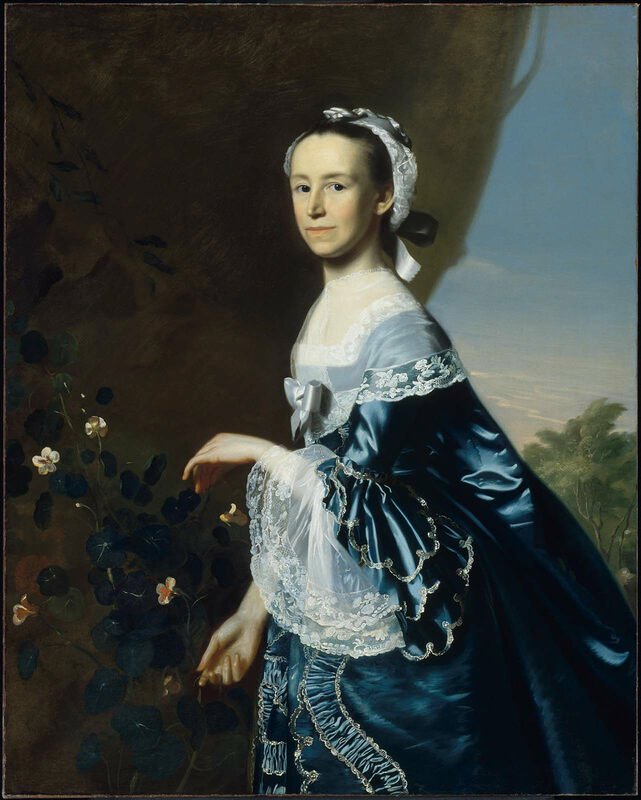 Donna Thorland: I want to reclaim early American women from their Victorian intercessors. I was reading Carol Berkin’s excellent Revolutionary Mothers and was intrigued by her mention of Elizabeth Ellet’s 19th century Women of the American Revolution. Ellet’s book kept the memory of Revolutionary women like Mercy Otis Warren alive, but also re-imagined them to appeal to Victorian ideals. Warren got herself on a British hanging list writing seditious plays and penned one of the first histories of the Revolution (and she’s the inspiration for the heroine of my third Renegades book). Ellet characterizes her as a pious homemaker who never put politics before family. Who is the real Mercy Otis Warren? Ellet describes the surface of a card table embroidered by Mercy as covered in flowers painstakingly copied from nature. The table is in Pilgrim Hall. It has got flowers on it. It has also got several hands of three-card Loo depicted, along with counters. This woman gambled. She was a person, not a paragon. Pamela: Sounds like we may see a spectacular card table in a future book. As an erstwhile art historian myself, I especially appreciate your careful yet never pedantic attention to details of material culture, from costume and dress, to interiors and decorative arts. It’s a very tangible way the stories are enriched by your background in museum work, and your interest in the domestic environments which your characters inhabit. Do you think we can view Kate’s act of performative and provocative femininity as both bold patriotism and a form of “turncoat” betrayal — or denial — of who she really is as a modest Quaker woman? Of course both identities become inextricably intertwined and equally authentic aspects of Kate as she grows and evolves through the novel, but I am curious about how you conceived such a wonderfully complex character. Is she an unassuming spinster who becomes a bold badass, or a bold spinster who was just waiting for the opportunity to break free of her unassuming surroundings? Donna Thorland: I wanted to give Kate something that more heroines deserve: a strong female role model. If Kate hadn’t met the widow, she wouldn’t have broken from her setting. It’s a common paradigm for male protagonists—for an experienced mentor to see promise in the young hero—but heroines are more often singled out for their beauty or kindness or other “feminine” characteristics, and then usually by the hero. Pamela: With THE REBEL PIRATE’S heroine, Sarah Ward, you have given us another protagonist who obscures her true identity, and in this case she meets the hero while disguised as a boy. And where there was a highly dangerous and uncomfortable love triangle in THE TURNCOAT, Jennifer McQuiston recently described what goes on in your new book as a “love rectangle.” These are complicated, edgy romances, and a far cry from wallpaper-ish drawing-room historicals. Which other books and authors have most influenced your romantic, swashbuckling, yet hard-edged vision of Revolutionary heroes? Donna Thorland: In fiction, I think that what I write is closest to Dorothy Dunnett and George MacDonald Fraser’s work, but my perspective on the Revolution is informed by a lot of non-fiction as well. There is an acid tone to some 18th century journals—the engineer John Montresor had a particularly dry wit. A J Languth’s Patriots is one of my favorite general histories of the Revolution, because it highlights the role that character played in the conflict. Events turned on personalities, bold, flawed, timid, stalwart. Men and women of incredible ability—and fallibility. Pamela: Speaking of fallibility….. In general, I think people may know, or think they know, much more about the earlier period in Salem’s history, and the infamous persecutions of 1692. Do you think people will be surprised by any of the history in this novel, especially how cosmopolitan and prosperous the city was in the late 18th century? Donna Thorland: This was our daily challenge when I worked at the Peabody Essex Museum. The Witchcraft Trials of 1692 are a seminal event in American history—you can practically hear the door close on the Puritan hegemony and see the enlightenment beckoning on the other side—but the rest of Salem’s history is just as remarkable. During the Revolution, Salem took more British prizes and outfitted more privateers than any other American port. By 1804 she was the richest city, per capita, in the nation. She produced, arguably, the finest architect of the Federal period in Samuel McIntire, and the most important American novelist of the romantic period in Hawthorne (never mind that we practically ran him out of town on a rail for his unflattering portraits of local luminaries—hopefully I won’t meet the same fate…). Pamela: I doubt it! More likely a festive book signing at the House of Seven Gables… or the Salem Athenaeum…? You also work in film and television – how has this influenced the way you construct novels? And what about your innovative use of short videos to promote historical novels – how fun and fabulous are these Vines? DONNA THORLAND: Novels are a bit like television in that readers are inviting your characters into their home. Your characters have to be people that your audience wants to spend time with, to learn more about—or they will change the channel or close the book. Making the Vines was a crazy amount of fun. We shot several of them in Hamilton Hall—think a Regency-era assembly hall straight out of Jane Austen, but in Salem—built by Federal architect Samuel McIntire and in continuous operation for over two hundred years. It also happens to be around the block from my house, and friends and neighbors were able to drop by to lend a hand. When you live in a historic district, your friends and neighbors can also often lend you 18th century pistols or a spare neck stock. 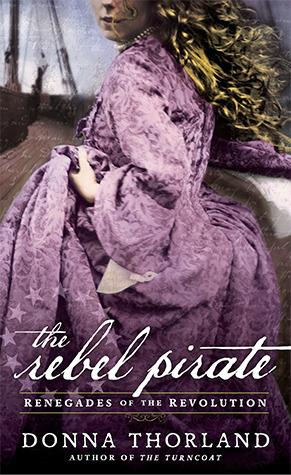 THE REBEL PIRATE (2014) and THE TURNCOAT (2013) are available from Penguin/New American Library in the usual formats and places. I received a review copy of The Rebel Pirate and purchased my copy of The Turncoat. Name: Gideon Horn, the Pirate Lord, terror of sea-going aristocrats, Robin Hood-like wealth re-distributor, Utopian visionary. Falls For: Miss Sara Willis, righteous prison reformer and champion of female convicts, stepsister of the Earl of Blackmore. Hangs Out In/On: The high seas, aboard the Satyr; an uncharted island in the South Atlantic. 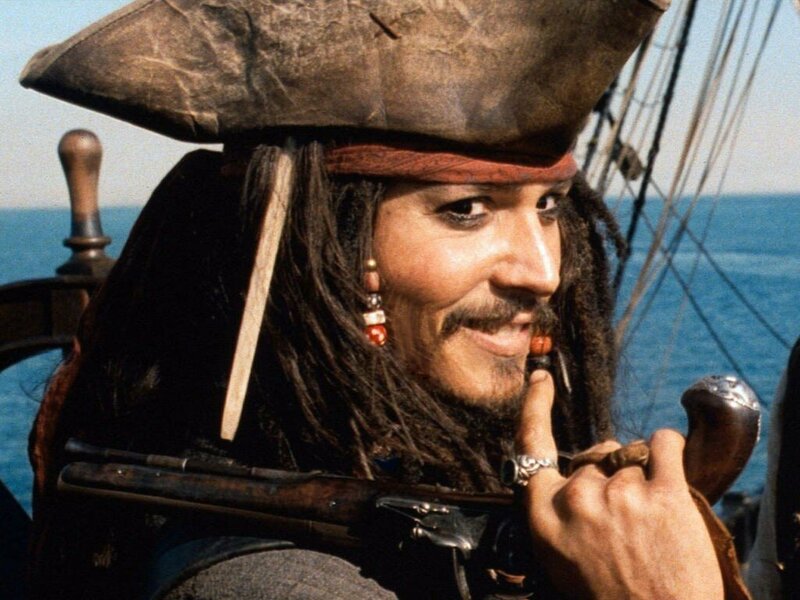 Likes: Flies a horn-y Jolly Roger, yearns for a mother’s love, dreams of a utopian colony, kidnaps a boatload of convict women to get things started. Dislikes: Anyone with a title. Badass Hero Moment: Capture of the Defiant. Badass Annoying Moment: The Atlantis/Utopia concept is so flawed it’s hard to take Gideon’s insistence on the kidnapping and forced marriages seriously. (too) Frequently Described As: Thunderous. Taut. Not really, but it’s funny to think about. I’m pretty sure the re-issue cover image is Avon’s attempt at a mash-up of Jack Sparrow-beadazzled style with traditional chiseled chest romance hero. To Read Or Not To Read? First and favorite in the Lord trilogy. Somehow SJ mixes together pirates, convict ships, struggles for survival, and class conflict while keeping the whole thing frothy and fantastical. Yet in spite of the fact that it lacks grit and substance (even the “mean” convicted prostitute is a pushover for Sara’s good nature, and the pirates are as tame as Disney — think Peter Pan or Pirates of the Caribbean), it works as a setting for Gideon’s and Sara’s character-driven story. There are very nice secondary romances, and Sara’s determined and ruthless brother the Earl of Blackmore certainly got my attention as the future hero of the next book. What is your favorite pirate romance and/or who is your favorite pirate badass?